The word carat may be used with both gold and diamonds, but in both cases they connote something very different. For diamonds, a carat represents the diamond weight, and for gold, a carat represents its purity. The combination of higher carat gold with higher carat diamonds means ultimate luxury. If you are lucky and have the means to afford such a treat for your beloved there is nothing else I think she’ll ever ask of you for the rest of her life. 2 carat diamond set in 24 carat gold – this is expensive, classy, delicate and really valuable. Makes this a deadly combination can be explained in the following. Read Carefully! Whether you search the internet, visit jewelry stores or even ask your friends who have diamond rings – most of them will tell they have a 1 carat diamond ring and the like. Rarely will you come across a person with a 2 carat diamond wedding band. 2 carat diamonds are an uncommon size. 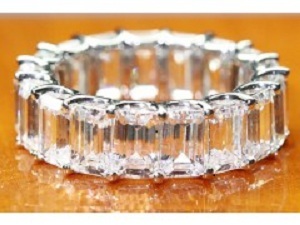 They cost the more than double of a 1 carat diamond, and are hand crafted for jewelry. The bigger a diamond, the more it costs. This is also because the clarity of a bigger diamond is can be easily recognized even by the naked eye. The size makes it possible to easily detect defects if any. 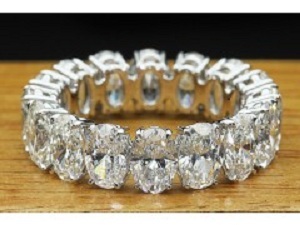 These diamonds, also because they are larger, can be used more innovatively. They can be given a number of extra cuts than smaller diamonds. 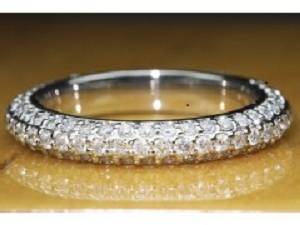 Jewelers also get an additional chance to enhance their brilliance and fir them into a number of different settings. As already told the term gold connotes its purity. The higher the carat of gold, the greater its purity- that’s the rule. The purist gold is in fact the 24 carat gold. This is the reason why gold jewelry is taken as consisting of 24 parts. So, when we talk about 18k and 14k gold, it indicates 18 parts of gold and 6 parts are other metals, and 14 parts of gold and 10 parts of other metals respectively. 24 carat is 100% gold. It’s the costliest gold, and the most delicate too. When we talk about pure gold, it is the most malleable form, which means it can easily slip out of its shape, and cannot be worn every day. It’s precious, delicate and needs to be carefully kept. This is why for everyday wear people choose less carat gold, mixed with other metals that impart it greater strength. Combining the best quality diamonds and the highest and purest quality gold makes for an ultimate luxury. On the one hand you have the rarest diamond, and on the other, you have the purest gold. The combination also represents a subtle combination between the strong and the delicate. The malleable gold with the hard worn diamonds, any girl receiving a wedding band like that would be the happiest brides to be. If it’s time for the proposal and you have what it takes to buy a 2 carat diamond wedding band in 24 carat gold, go for it.